The most important thing in a harp for a beginner or student is the spacing and the layout of the strings - it means your fingers meet the strings at the right places. Many cheap harps have the strings set too wide apart, leading to uncomfortable stretches, especially for little hands. When you are beginning to learn the ancient clarsach traditions, you need to repeat the basic finger movements many times, to fix them in your muscle memory, and so it is best if you can practice on a harp that is set up with the correct string spacing and layout. It’s also important to have a useful range of notes. The beginners tunes for the old Gaelic harp tradition (as detailed in my book Progressive Lessons) are naturally centred around the two unision strings at g below middle c (na comhluighe or the sisters), and the old harp tunes generally take advantage of the full range of the instrument. It can be frustrating to learn on a small medieval harp or a miniature harp where everything has to be played up a fourth or an octave, sounding shrill and high. The overall shape and proportion of the instrument is important too - if a harp is too narrow, then the hands, wrists and knees meet the instrument in awkward places. 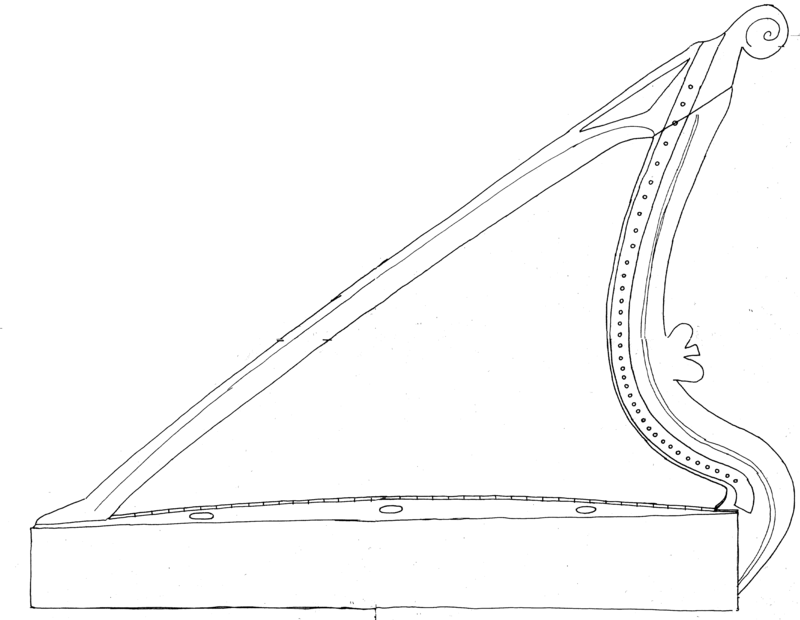 Copying one of the historic instruments ensures that these aspects of the design are right. The idea of these drawings is to show a harp that has a decent number of strings and a decent bass range suitable for everything from the beginners tunes up to Carolan or anything you can throw at it really. It has the string spacing, layout and overall ergonomics of the Hollybrook harp - a very elegant and handsome baroque Irish harp. I have prepared these templates for making an 18th century Irish harp. You can download each image file by clicking on the tiny version here. Each one can be printed out at 100% (or 100dpi). Your computer and printer should have a setting to print out full size on more than one sheet of paper, which you can then tape or glue together to make up a full size template. These drawings are based on R.B. Armstrong’s 1904 book and are not guaranteed to be exactly the right size or shape, but they should give you a workable instrument. The soundbox is shown built up from pieces, as on the original. You should read pages 96 to 100 of Armstrong’s book in conjunction with these drawings. Any questions, please ask. 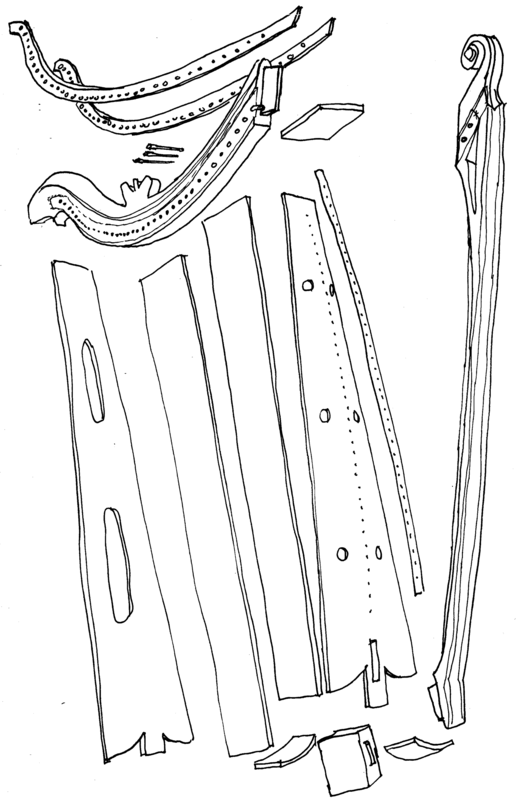 This drawing shows an overview of the assembly of the harp. Hopefully this will give you all the information you need to turn the individual templates below into a complete instrument. Note that the neck-pillar assembly should be mounted slightly off centre to the right on the soundbox, but not so much that the strings run vertical. The strings are meant to be slightly fanned out and angled. There are three metal strips which define the positions of the string ends. The two curved iron cheek bands fit one each side of the neck. The iron centre strip runs down the centre front of the soundboard. Make these iron strips first, and use them as your drilling templates to drill the holes in the neck and the soundboard. Fix them to the wood with little nails. The old harps usually had a soundbox carved from a solid piece of timber, with the open back closed by a press-fit panel. You can do this, or you can copy the Hollybrook harp which has the soundbox glued up from planks to imitate the carved box by keeping the grain direction and orientation parallel. The Hollybrook harp has an arched soundboard, carved like a violin - you could make it flat if you wanted to simplify things. The soundboard should be 1/4 inch thick. I believe the back panel of the Hollybrook harp is just glued on to the back of the soundbox, and is not removeable - it has a big access hole cut in it. The Hollybrook harp does not have individual string shoes, to protect the wood around the string holes. It has a long iron strip that goes right from the top to the bottom of the soundboard. Smooth the holes in the iron strip, so they don’t have sharp edges to bite the strings. On the Hollybrook harp, the corners of the soundbox are fitted with little 3/4 round mouldings. You could leave these off, or include them, as you prefer. The forepillar is pierced towards the top, and is carved into a subtle Y cross-section for strength and lightness. It has a very elegant scroll at the top. The neck has two iron bands, one each side. Make the bands first, then make the neck and pillar, joint them together, and peg the joint with wooden pegs. Then use the iron bands as your template for driling the holes in the neck for the tuning pins. The holes drill right through the joint. On the Hollybrook harp, the iron bands are recessed so they lie flush with the surface of the wood. You could put them on proud if you prefer. Fix the iron bands on with little iron nails. I have drawn the crude wooden crown that is on the top of the neck. I don’t know if this is original, or a later addition. You can include it, or leave it off, as you prefer. On the Hollybrook harp, the joint between the neck and soundbox is quite complex, and I don’t understand it all. I have drawn a simpler joint with a tenon that slots into a mortice in the top of the soundbox. Can’t get these plans printed out full size? I can do it for you and post you the prints. Printed on multiple A4 sheets, pasted together, and folded. 5 large drawings: soundbox, neck, pillar, metal strips, and overal layout. Once you have the wooden components as shown in the drawings above, you need to add the metal hardware. Tuning pins: you need 37 taper tuning pins. Don’t skimp by using cheaper zither pins - they make tuning much more difficult that it should be. I recommend you get tapered tuning pins from Dan Speer, and I suggest you ask him for no.4 pins, 3 inches long. Get brass if you are feeling flash, or steel if you are feeling cheap. I recommend asking for blanks, without the square drives - you can hammer-forge the fat tapering square drive, which looks better and works better than a modern cut parallel square drive. Ask for him to drill the string holes 1.5mm, this will fit your thickest wire string and bigger holes just make stringing harder. Ask him also to send a matching taper reamer for making the tapered holes in the harp. Drill the holes from the left side of the neck, and ream from the right side - this will help keep everything in line. (left and right from a player’s point of view). The tuning pins are inserted from the right side, so that the player tunes with their right hand holding the tuning key applied to the square end of the pin, and the string is attached to the left end of the pin. Strings: I can supply you with brass wire strings suitable for this instrument. See my wire page for details. Click here for a stringchart for this harp. Bag: An old sleeping bag is an ideal quick and easy bag to carry the harp in. For a bit of extra luxury, cut and stitch it to shape and add a button to close it over the neck of the harp. Tuning key: I have cheap keyring tuning keys available. You can add a wooden handle to make a full sized functional key. Electric tuning machine: just get a cheap "chromatic tuner" from your local music store. Or if you have a fancy phone, try the Cleartune app for iPhone or Android. Select the ‘Pythagorean just’ setting to help you tune more accurately. Please feel free to let me know how useful you found them by sending a little contribution to the running of this free information website. And send me a photo of your new harp!